We made the vegan version of this delicious meal offered by Elizabeth of the Greens and Seeds blog. She was inspired by Heidi Swanson’s Tempeh Curry, We just harvested some of our potato crop this ear and have been looking forward to new recipes using the harvest. This was perfect. 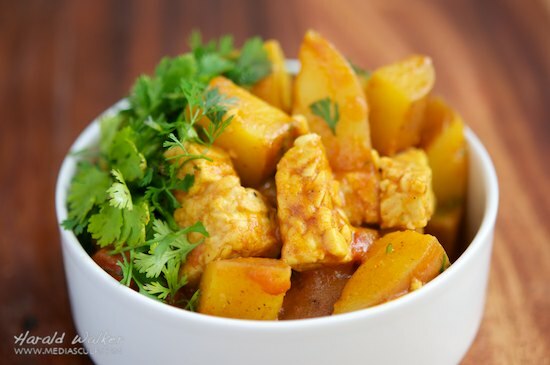 It’s a mild curry that doesn’t over-power the flavors of the potatoes nor the tempeh. We really enjoyed the recipe and will be having it more often through the year. Posted by Chris Walker on August 15, 2012 in Potato, Reviews, Tempeh.